If you're coo-coo for Cocoa Puffs, you'll probably be coo-coo for this cereal. It tastes almost exactly the same. New Cocoa Puffs Brownie Crunch - true to it's name - is crunchier than the original cereal which was introduced way back in 1956. 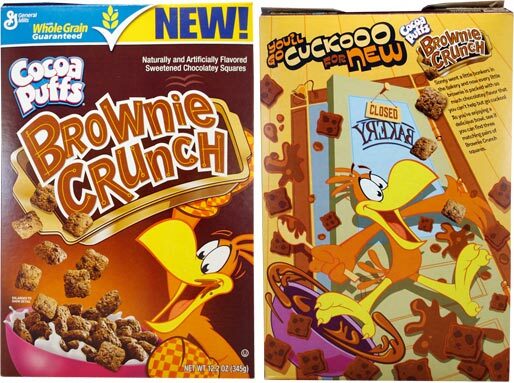 The cereal pieces look like square versions of Double Chocolate Cookie Crisp cereal (also General Mills; 2006) as opposed to the puffed balls of original Cocoa Puffs. Small dark specks dot each piece of this new cereal. While they give a visual impression of mini-chocolate chips and help cement the illusion of tiny brownies, the specs have no real effect on the flavor. 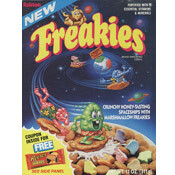 This cereal has the same relentless chocolate flavor of Cocoa Puffs - that slightly artificial cereal-chocolate that so many of us love... thanks more to childhood memories than an appreciation of flavor. For those who measure the worth of a chocolate cereal by the amount of chocolate milk in the bottom of the bowl, you won't be disappointed. This cereal produces more chocolate milk than Count Chocula and maybe a smidge less than Cocoa Pebbles. The last extension of the Cocoa Puffs line came in 2008 in the form of Cocoa Puffs Combos - with vanilla flavored puffs mixed in with the original chocolate puffs. This latest extension is better. It's better because original Cocoa Puffs is better and this cereal tastes almost exactly like original Cocoa Puffs - only crunchier. Nutritional concerns: Each 3/4 cup serving has 110 calories, 1.5 grams of fat (0 saturated and 0 trans), 2 grams of dietary fiber, 2 grams of protein and 9 grams of sugar. 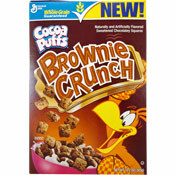 What do you think of Cocoa Puffs Brownie Crunch?